Traditional Tom Kha soup is made with chicken stock and fish sauce and it can be challenging to find a Thai restaurant to make the soup without these ingredients. Often fish sauce is considered vegetarian in Thai cuisine. The best way to have Tom Kha is to find your kitchen and make it yourself! This way you can modify the flavorings exactly to your liking. 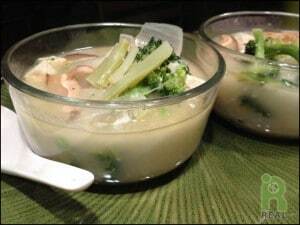 For a richer broth add more coconut milk, for a less tart flavor reduce the amount of zest added to the broth. Spice it up with more cayenne or leave it out entirely. I crave this soup when the weather gets really cold. In a large soup pan add the onions and carrots. Cook on medium high heat for about 10 minutes, stirring regularly. The onions will quickly steam, providing moisture to aid in cooking. If they vegetables start to stick, you can add 1/4 of water. When vegetables are soft, add in water, coconut milk, kaffir leave or zest with juice, sugar, cayenne, mushrooms and tofu. Take the ginger and lemongrass and place them in a large tea ball and close securely; or wrap them in cheese cloth, tied with a string, Place this in the coconut broth to add flavor to the soup while keeping the tough fibrous pieces separate. Cook until mixture boils, reduce heat and simmer, covered for about 20 minutes. About 10 minutes before serving add in the broccoli and finished cooking. Serve, garnished with cilantro and lime wedges.